Last week, our area got hit with an ice storm. As a native of where I live, this was the first ice storm I have ever experienced. Schools were out from Tuesday through Friday due to the icy roads. 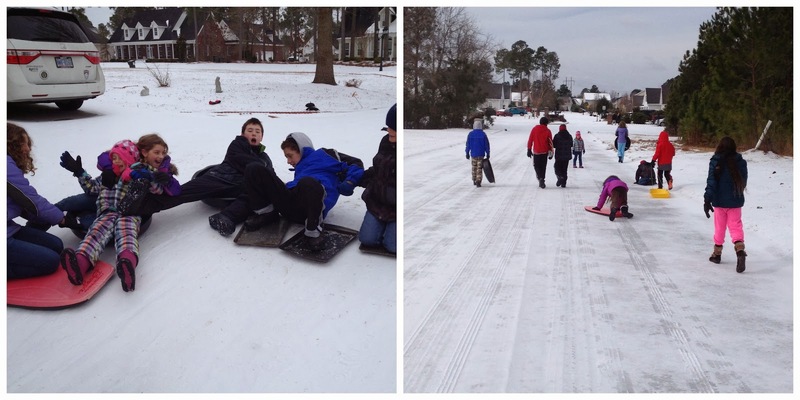 But, with our homeschooling we only took last Wednesday off to sled on the ice and did school work on the other days. 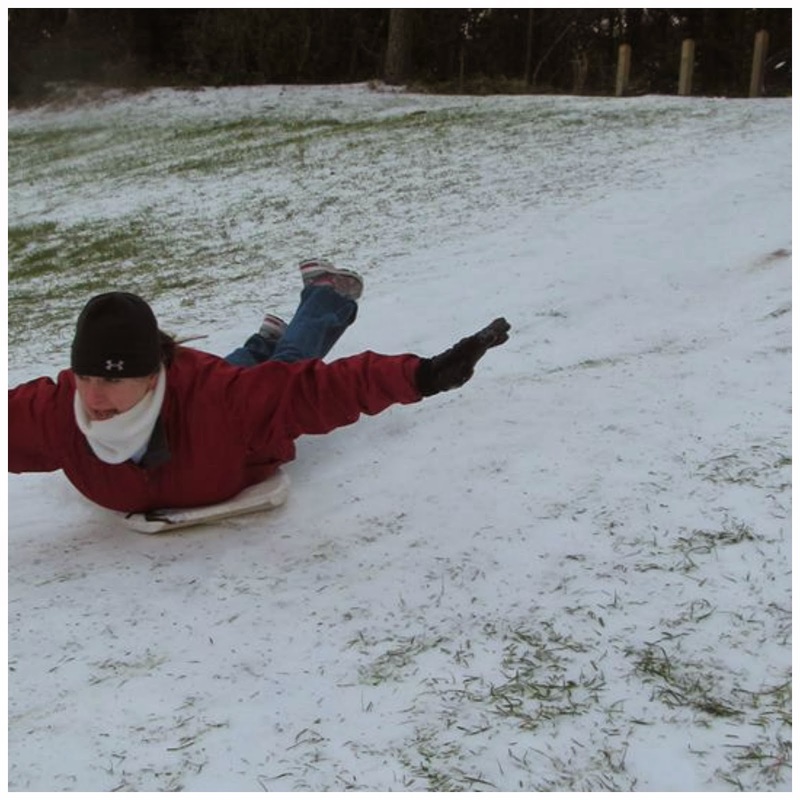 I went out in the morning with our cupcakes (I'm the one below looking like I'm flying like Super Man Woman :) ) and then my husband took the kids out to sled after lunch while I napped in a quiet house with the baby. (Sledding wore me out!) 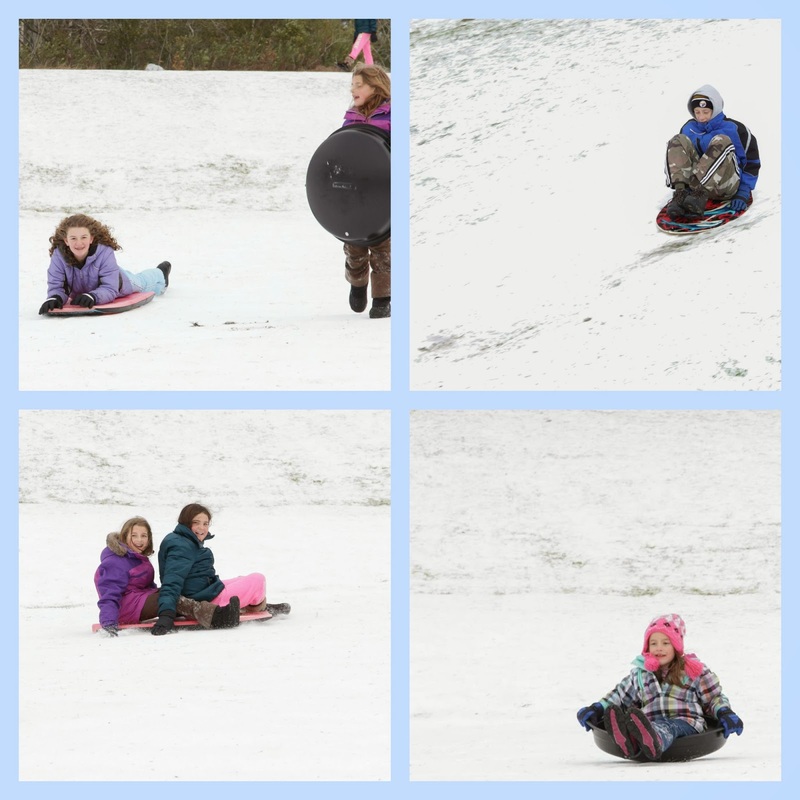 As you can see from some of the pictures, we used body boards, skim boards, and even cookie sheets to go down our neighbor's sloped driveway and down hills at a local park! It was great fun! 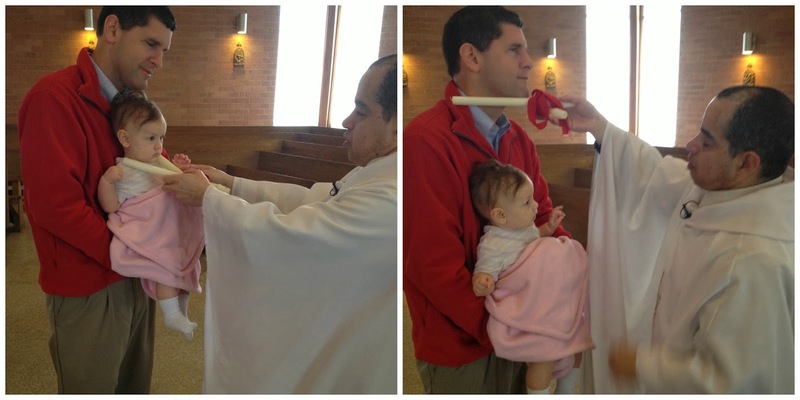 This past Sunday, February 2, we celebrated the Presentation of Our Lord which is often referred to as Candlemas. It is a tradition to bring candles from your home to have the priest bless them. As stated in this article HERE,"Our lighted candles are a sign of the divine splendor of the one who comes to expel the dark shadows of evil and to make the whole universe radiant with the brilliance of his eternal light. 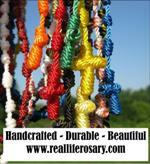 Our candles also show how bright our souls should be when we go to meet Christ." 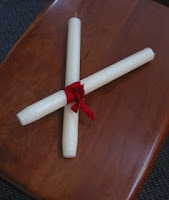 Here is a picture of some of our candles with others' candles that we placed on the altar and Father Alex blessed them. I even brought a candle that was one of our wedding gifts in 1997 that was made with our wedding invitation that I had never got a priest to bless until this past weekend. 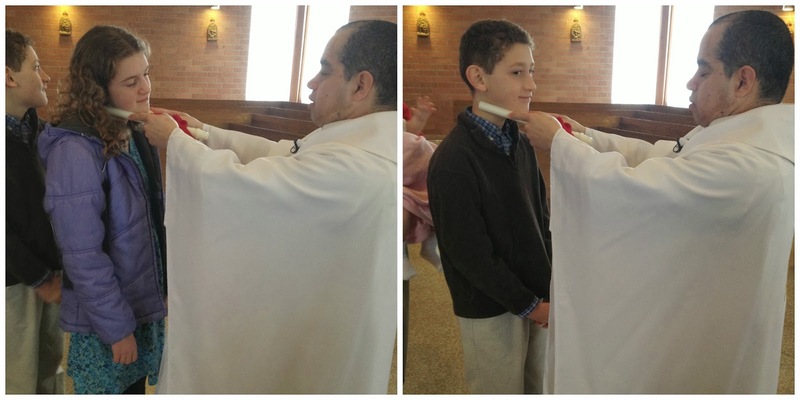 Today, February 3, is the Feast Day of Saint Blaise. I didn't know much about this saint, but found out more about him during our homeschool day today. 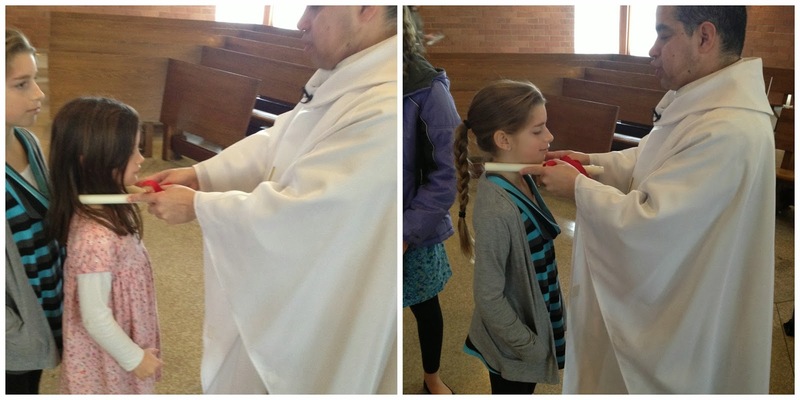 Yesterday at Mass, in honor of Saint Blaise, everyone got their throats blessed by Father Alex. 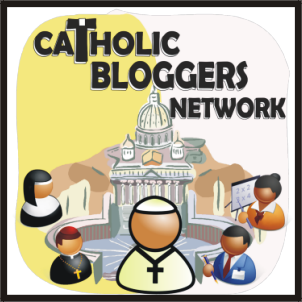 As written in this short biography of Saint Blaise, "Many Catholics might remember Saint Blaise's feast day because of the Blessing of the Throats that took place on this day. Two candles are blessed, held slightly open, and pressed against the throat as the blessing is said. Saint Blaise's protection of those with throat troubles apparently comes from a legend that a boy was brought to him who had a fishbone stuck in his throat. The boy was about to die when Saint Blaise healed him"
The priest holds two candles tied together with a red ribbon in the form of a cross at the throat of the person seeking a blessing and prays aloud: "Through the intersession of St. Blaise, bishop and martyr, may God preserve you from throat troubles and every other evil. In the Name of the Father, and of the Son, and of the Holy Spirit. Amen." The sledding looks fun! Great ingenuity! 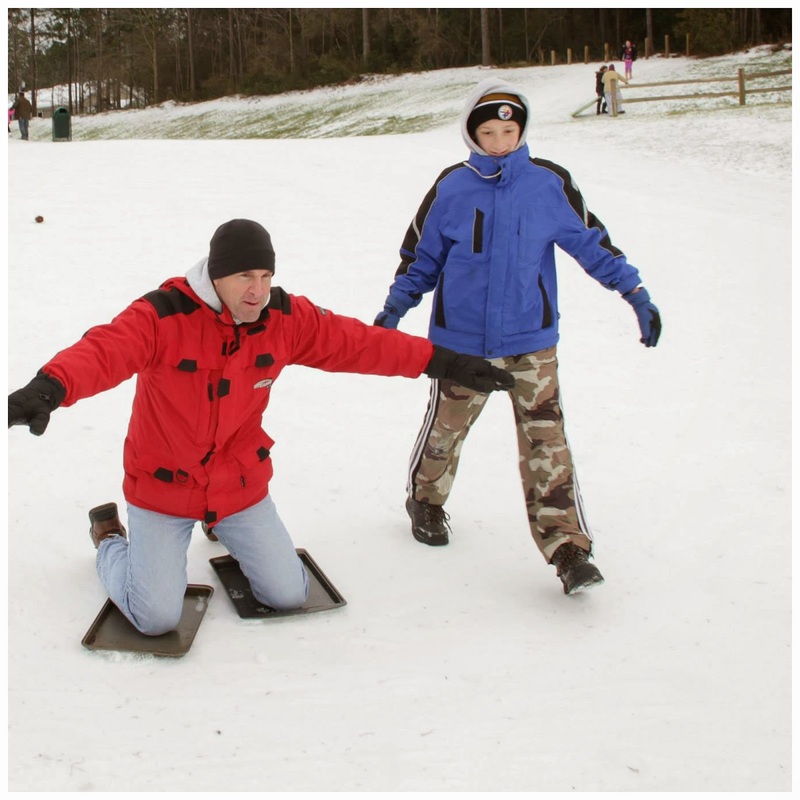 We do not have sleds either. 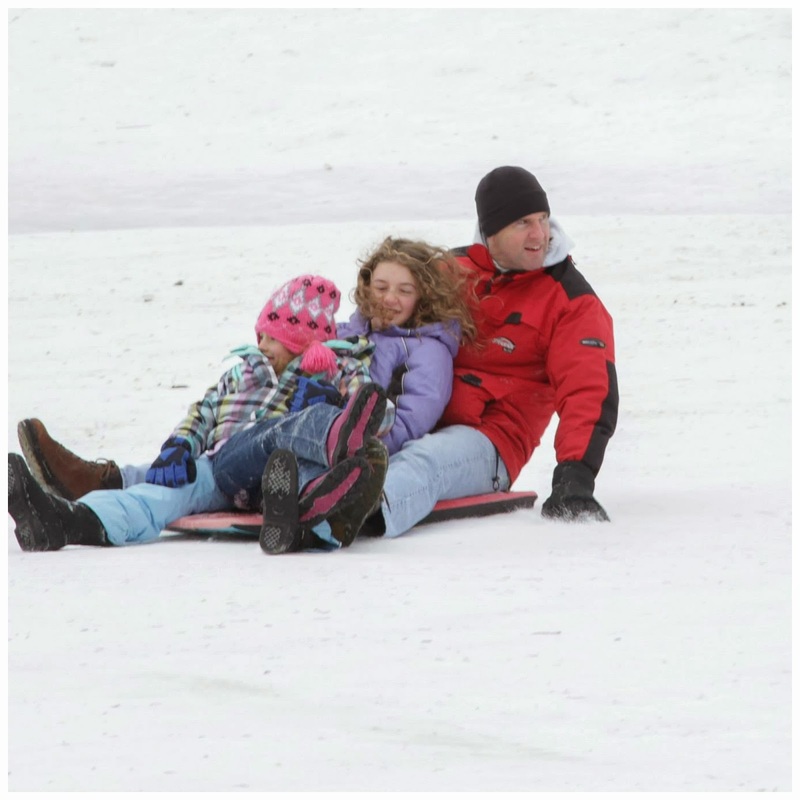 My husband had huge sheets of cardboard and he cut them into smaller pieces for each of the kids to sled with. The baby is so darling. Just darling! I already miss Clementine being that age. And yet, I have thoroughly enjoyed every stage she's been in :) Have a great week, Tracy! Hi Tracy! 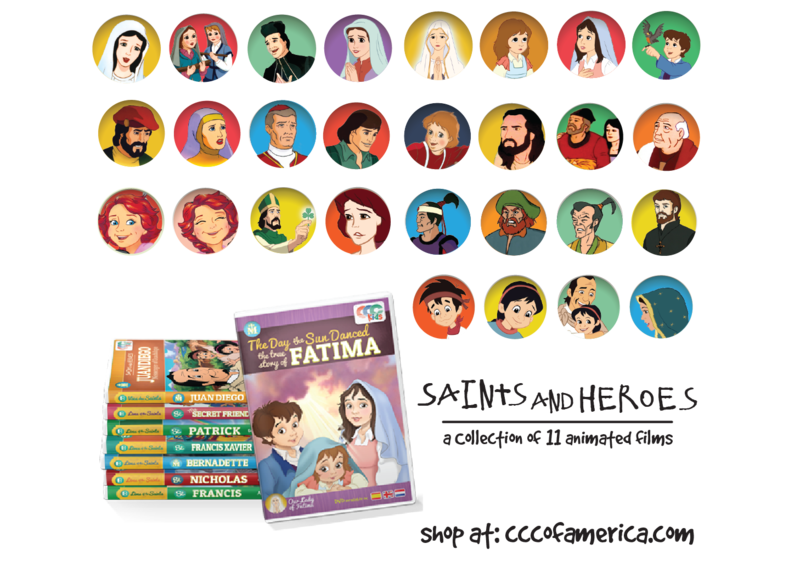 I am coming over from Patty's blog, where she passed the torch to you for the Sunshine Award. 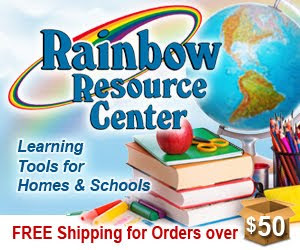 I love to meet new bloggers, so this is fun for me! I have three grandchildren, so I am reminded of them in your little six month old. They do grow fast, no doubt about it. St. Blase is one of my favorite days, because of the blessing of the throats. 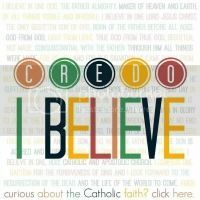 Something about winter-time and being blessed seems so powerful and timely. I hope you will all be protected in the weeks ahead. Hi Patty! Cardboard works well too I'm sure! 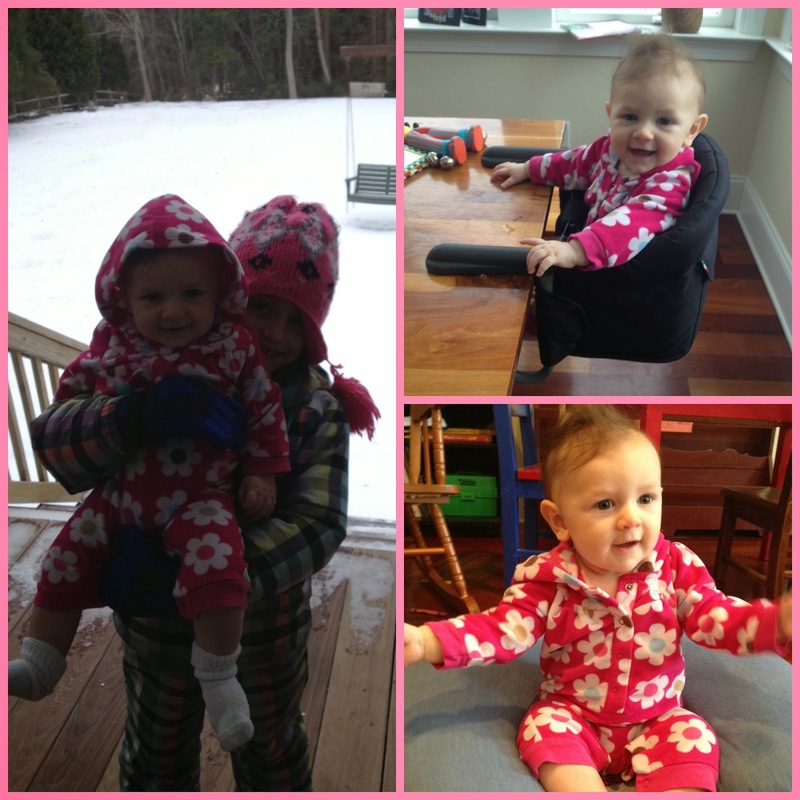 It's amazing how creative one can get to enjoy the cold and ice :) Your baby is growing so fast and is so beautiful! It seems like yesterday you were pregnant with her! Hope you had a great week! I've enjoyed learning a little more about Saint Blaise. I like your comment about how blessing throats in winter seems timely, especially with so much sickness during this time of year! 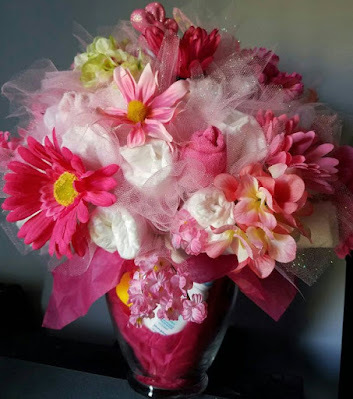 Thank you for stopping in to comment and nice to "meet" you!